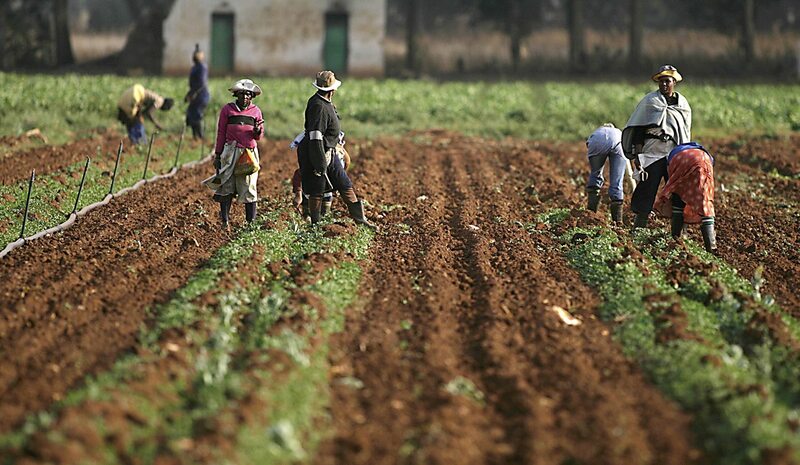 The devastating impact on the family of a worker who had lived on a Citrusdal farm for almost 40 years before he was dismissed and evicted, potentially leaving his wife, children and grandchildren destitute, was highlighted in a landmark Constitutional Court ruling on 14 July. A majority judgment found that the man’s wife was entitled to security of tenure in her own right. The ruling has provided legal clarity on an issue that affects some of the most vulnerable workers in the country, women on farms who were, until the ruling, regarded as spouses rather than as individuals. By MARIANNE THAMM. For 38 years, Jan Klaase worked as a general labourer on Noordhoek Farm in the Citrusdal District in the Western Cape. It was 1972 when he, like his father before him, began working on the farm and at first Klaase Jr shared a house with his father. Then Jan Klaase met Elsie, she fell pregnant and after the birth of their first child, Elsie moved into her father-in-law’s house. Mr Klaase Sr later built a small cottage on the premises for his son and new family. The Klaase couple formally married in 1988 and continued to live on the farm for more than 30 years – a lifetime. Elsie, like so many women in the region, became a seasonal farmworker. By the time they were finally evicted in 2014, three generations of the Klaase family lived on Noordhoek farm. Things had begun to go pear-shaped four years earlier, in 2010, when Jan Klaase had been dismissed by farm owner, Jozia Johannes van der Merwe. Klaase had been charged with absconding from work and had opted for a settlement agreement. He also undertook, according to court papers, to vacate the house he had lived in most of his life by 30 June 2010. When he had not done so by the due date, Van der Merwe wrote to Klaase demanding that he move out within 30 days. Jan Klaase and his family stayed put – there was nowhere for them to go. Unsurprisingly, the matter then ended up in the courts. First stop was the Clanwilliam Magistrate’s Court where only Jan Klaase was named as a respondent in the eviction proceedings. But the Van der Merwes wanted Klaase as well as everyone else who occupied the house “through him” to be evicted as well. That is how it had always been done. In that instance a probation officer had recommended that the family remain on the farm until alternative accommodation had been found. At this point Jan Klaase had indicated he had been willing to pay R60 a week in rent. However, he continued to live on the farm at no cost while working elsewhere. At a later meeting with the Municipality in 2012 “the parties agreed that there was no possibility of Mr Klaase getting alternative accommodation in the foreseeable future due to the housing shortage in the district”. The Klaase family were now caught in a bureaucratic and legal nightmare. Poor, homeless and sporadically employed and vulnerable. Like thousands of others. In 2014 the Magistrate’s court granted the order evicting Jan Klaase “and all those occupying through him, including Mrs Klaase” from the farm. The court held that Mr Klaase’s right of occupation arose from his employment on the farm. Once he had lost his job, that was it. The court also found that provisions of the Extension of Security of Tenure Act (ESTA) had been complied with and that “it was not necessary to provide Mr Klaase with alternative accommodation as no alternative accommodation was available”. The matter then ended up in the Land Claims Court which confirmed the eviction order of the Magistrate’s court. Enter Mrs Klaase, who sought an order to be joined as the second respondent in the eviction application. She also asked for the suspension of further proceedings, including the execution of the eviction order, pending the determination of her rights in terms of ESTA. The owners said that they needed the Klaase family to vacate the house to make it available for permanent employees. And so it was that Case CCT 23/15 found its way to the Constitutional Court where it was heard in September last year. Here in a majority judgment by Judge A J Matojane (with judges Cameron, Madlanga, Nkabinde and Wallis concurring) and handed down on 14 July, it was held that ESTA was enacted to give effect to section 26(3) of the Constitution and to provide security of tenure to people living on farmland whose tenure was insecure as a result of past racially discriminatory legislation or practices. The judges found that the eviction of an individual on the basis of the conduct of a spouse or partner had “a significant impact on security of tenure not only for Mrs Klaase but also other similarly situated persons”. The ConCourt found that Mrs Klaase had “a direct and substantial interest in the eviction order granted against Mr Klaase and should have been joined to the proceedings”. Because the farm owners had not objected to Mrs Klaase living on the farm “for decades” and had never taken steps to evict her, they had consented to her occupancy. Mrs Klaase, the court ruled, fell into the “first class of occupiers being an ‘occupier’ for purposes of ESTA”. The Klaase family, the court maintained, had the right to live in the house on the farm. In this case the Women’s Legal Centre represented the Women on Farms Project and was admitted as a friend of the court. In a statement Hoodah Abrahams-Fayker, an attorney at the Women’s Legal Centre, welcomed the judgment, saying the Land Claim Court’s finding that Mrs Klaase occupied the premises “under her husband” subordinated her rights to those of Mr Klaase and that this “demeaned her rights to equality and human dignity”. The current interpretation of the law reinforced the notion that women’s access to secure tenure and housing on farmland is embodied by a male occupier (who is usually the head of the household). “It makes it virtually impossible for women to establish independent occupier status, even where they also work on the farm, and thus impacts negatively on their protection against arbitrary eviction. The court was called upon to come to the aid of female farmworkers who are reliant on their spouses and who find themselves without a home if their spouse’s job is jeopardised. The current dispute over the interpretation of ESTA should be of concern due to the vulnerability that it brings to a rather significant portion of our society, such as those that live on other people’s land or property,” said Abrahams-Fayker.